I love my slow cooker. As a working man with a working wife, it is so nice to come home to a meal that is already done and doesn’t need much work. Unfortunately, many of the meals seem the same. Tender meat (chicken, beef, pork) in some kind of sauce and generally with some vegetables that have been cooked soft. Lots of good dishes with good flavors, but sometimes you want something that just tastes a little fresh. This takes the best of both worlds and crosses the divide. 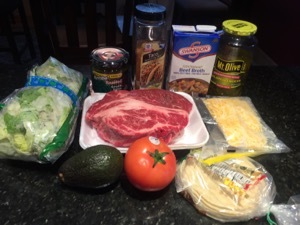 A hunk of beef, some green salsa and typical taco ingredients. Beef, broth and salsa in the slow cooker. 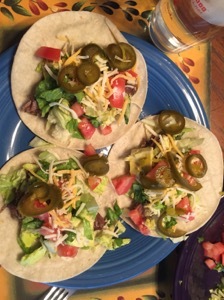 Yes, I liberally use jalapeños! 1. Lay the chuck roast into the bottom of a slow cooker with a tight-fitting lid. Sprinkle the taco seasoning mix over the beef. Pour the green salsa over the beef, followed by the beef broth. 2. Cook on Low for 4 hours. Add more beef broth if needed. Remove the beef from the slow cooker and shred with two forks. 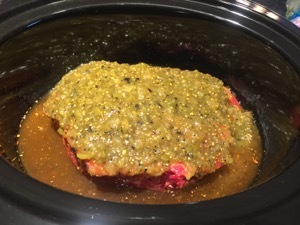 Return the shredded beef to the slow cooker; mix with the liquid. Serve hot. You might have had a better experience, whenever I use the slow cooker things turn “mushy” and kinda lose their texture quick! 😦 – Love what you made though, thanks for sharing. 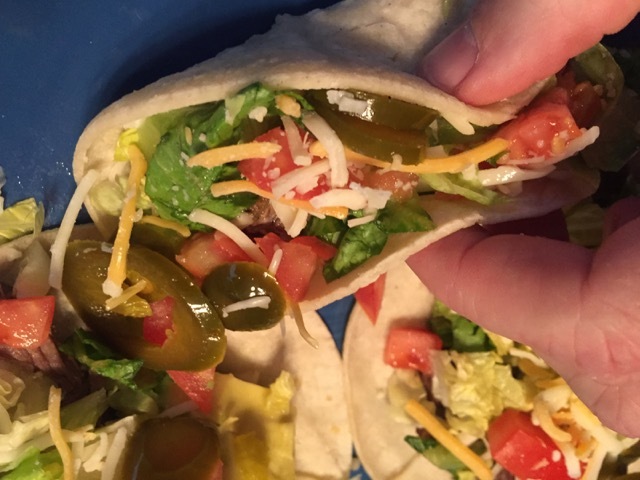 What a great, simple recipe – I too love my slow cooker and love how it fills the house with tantalizing aromas! Will be trying this!